This beautifully crafted mini-bucket mug is a new product in Keith Brymer Jones’s famous Word Range. This mini bucket mug has a capacity of 280ml and a retro signature blue stamp, which is hand-embossed into super white porcelain with the words “good morning!”. What better way to start your morning, than with a fresh dose of caffeine served in a Keith Brymer Jones mini mug? 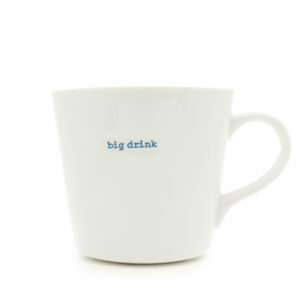 This designer mug is part of Keith’s iconic word range which he has been developing for over 3 decades. This mini mug is hand-stamped with the words “good morning!” in a vibrant blue, which contrasts with the bold white porcelain. Keith drew inspiration from the shape of an old water bucket in his studio in Whitstable, to create a stylish form for his ceramic bucket mugs. 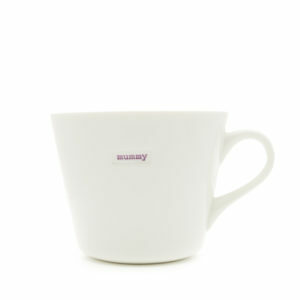 Each mug is hand finished with different words stamped into the porcelain making his collection bespoke and unique. Every piece in Keith Brymer Jones’s Word Range is microwave and dishwasher safe, making the collection practical for everyday use.